As the year draws to a close, it is time we reflect upon all that transpired in the rather unexpected year of 2016, and whilst there are a number of things to look back on (both good and bad), here in the bookish community it means time to reflect upon all the stories and authors we discovered in the year. Reading wise, 2016 was a pretty good year for me. I was able to delve into the world of Narnia for the first time, revisit Hogwarts and the wizarding world, as well as devour the words of tried and true favourite authors of mine whilst also discovering new to me authors I'd like read more of... Goodreads informs me that more than 50% of the books I read this year were 4 & 5 star reads - as I said, a pretty good year, right?! Often times it can be hard recollecting the books you read within a year, without consulting Goodreads, and whittling those titles down to just ten near impossible, but I found compiling my list of top ten books of the year pretty easy. The books I've shared below were all stand out reads for this year, and titles + authors I'd happily recommend others pick up and read. Books are not listed in a ranking system, but in the order in which I read them. I loved Slade House when I read it last year. Did you also read The Bone Clocks? I haven't read The Bone Clocks yet but am keen to - when I picked up Slade House I didn't realise they were connected, I just knew I wanted to experience David Mitchell's writing, and so I have my eye on The Bone Clocks now for sure! I LOVED Black Eyed Susans. I really want to read Love Anthony, The Wonder and really anything by Kate Morton. Great list! Black Eyed Susans is such a great read! Although Love Anthony didn't live up to my love of Still Alice by Lisa Genova, it is definitely my second favourite title of hers and I'd highly recommend it. The Wonder was a slower read for me, but still a story that stays with me and one I'd recommend to others happily. The House at Riverton was my first reading experience of Kate Morton and I just loved her writing style... More books by her on my horizon! Wonderful list! Black Eyed Susans will forever be one of my favorites. I'm glad you had such a great reading year! Happy New Year, Jade! I'm so glad I listened to your love of Black Eyed Susans and picked it up! I hope you have a very happy new year, Brandie! The Wonder made my Top 10 list as well! I love Emma Donoghue. Many of your other titles are actually new to me so I'm taking noes now and adding to my TBR. Happy New Year! Haha! I think all of our TBR's going to grow from this TTT topic! I have read Room and now The Wonder by Emma Donoghue; vastly different books but that only highlights the beauty of Emma Donoghue's writing to me. I really liked The Marvels, too, and someone commented on my blog stating that I was the first person that she saw really like that book. What did we see that no one else saw? I loved it. I always love Selznick. I couldn't imagine coming away and not loving a Selznick book - I love the story telling method! I haven’t read any of these, but The Wonder and Our Endless Numbered Days are on my TBR list. Hopefully I’ll be able to read them next year. Fingers crossed you're able to! Claire Fuller, the author of Our Endless Numbered Days, has a new release this coming year and I'm super excited to get stuck into that one! Anything by Kate Morton is amazing - she's one of my favorite authors. The Wonder is still on my TBR, but I hope to get to it soon. The House at Riverton was my first reading experience of Kate Morton, but I can totally see how she is a favourite author of yours - I'm keen to read more of her works. Haven't read any of these yet, but I have read some other books by Cecilia Ahern which I loved. And David Nicholls si definitely on my TBR as well! Happy New Year! Cecelia Ahern is one of my all time favourite authors, so it was only natural a title of hers made it on to my list. David Nicholls is such a wonderful author - his writing is so raw and relatable. Yay for a good reading year, an for entering Narnia for the first time! :) I remember reading Black Eyed Susans, it sounded like a good thriller, but I never got to it. May have to rectify that! I don't know how I had not traversed Narnia before!! Great list. I have yet to try a Cecilia Ahern book but she is on my list. And Kate Morton. I just heard on a podcast how good The House at Riverton is. So onto my reading list! Hope 2017 goes equally well. Oh, you have to give Cecelia Ahern a read - she is one of my all time favourite authors. The Marble Collector is also one of my favourite books by her, and I've read them all! I think you'll enjoy Kate Morton. I wish I had read her books sooner! It's definitely a good sign when the best books just jump out at you. This year I had to think a little harder to get the full ten. You have a great selection of books! I really want to read the Kate Morton book and Black Eyed Susans looks so good! So true, Katherine. A year is such a long time, especially if you read a large number of books like we tend to in the book community, and if they jump out at you then they're likely to be good 'uns. Black Eyed Susans is great - I'd highly recommend reading! I have been waiting all year for Marble Collector to become available on Kindle, I am going to order it, glad to see it on your list. Love Anthony was a great read but she is a favourite author of mine also. Black Eyed Susans is on my list. Great list. Brian Selznick is a beautiful storyteller. I'd definitely recommend Love Anthony - the plot is a really interesting and layered out, with the characters being well developed also. Hopefully much of the same this coming year too - happy reading! The Marvels is such a lovely story. I hope The Wonder comes in soon for you - I get so impatient waiting for library holds! Enjoy! Looks like you had a great year! Thank goodness for Goodreads, right? I'd be lost without it. It was a pretty good reading year. Happy reading in 2017! 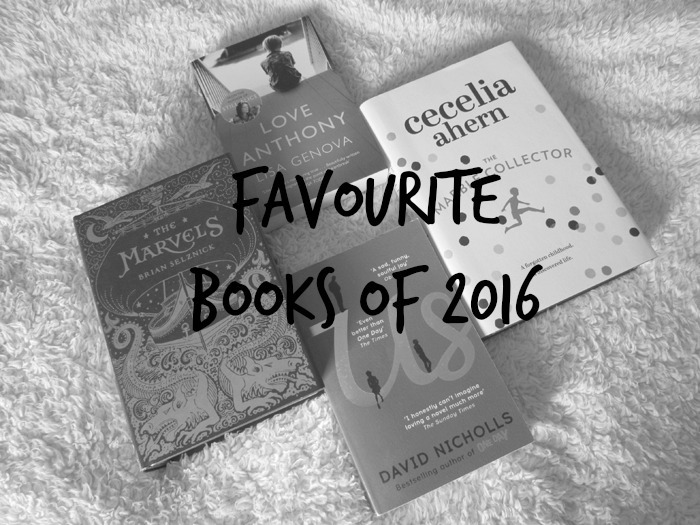 Haha - my wishlist has definitely increased since people have been sharing their favourite books of the year! I'd highly recommend Us - I think David Nicholls does such a wonderful job of portraying raw characters in relatable situations. The Wonder is quite different plot wise to Room, but such a powerful story nonetheless. Two great authors. Happy reading in 2017, Christine! Oh how I love The House at Riverton! Morton was one of the authors who really got me passionate about reading. I can see why - she has a wonderful way with words.